Sorry for being a bit quiet, I haven't been feeling great this week, nothing bad just not my usual happy self. I got an email last week inviting me to Benefits, Benefayre in Manchester this weekend. As I was going to be in Manchester anyway I decided to bob over. It was a bit odd being on my own and kinda wish i'd been with my friends but hey ho. The Benefayre was for the Charity Refuge and was set up like a retro fair. Hook a Duck, Mascara Hoopla, Nerf the Lemon. Before you went in you bought tokens for £1 each and the activities cost around 1 - 2 tokens. I only bought 2 tokens to start with and my first go was Nerf the Lemon. I don't know the real fairground name for this game (Shooting range?) I won some Porefessional stuff. I really wish I had more change on me as I'd have oved to have a go on the Hoopla and i'm not sure what the Oxygen thing was. 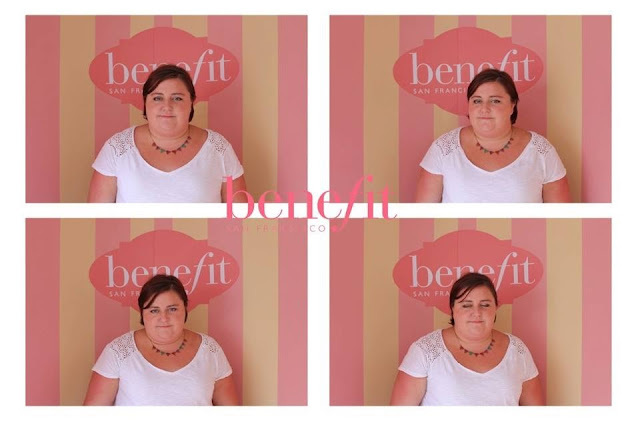 I decided on a make over as one I was on my way to a blogger meet up without wearing any makeup and secondly everyone walking around from that counter looked amazing! Everyone working the stalls were lovely and it was such a good atmosphere. I didn't catch the name of the girl who did my make up but she was really nice, friendly and talked me through everything she used. I was happy to let her have free rein with my face and I love what she did. ..... PhotoBooth! Sorry the popcorn cart was too cute not to include.